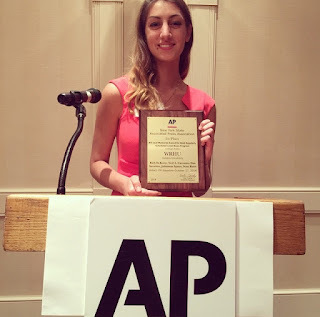 Over the weekend, WRHU (Radio Hofstra University) members and Pride Guide Juliana Spano took a trip up to Saratoga Springs, NY to accept 1st place in the Bill Leaf Memorial Award for Best Regularly Scheduled Local News program. WRHU's Newsline is a 30-minute live newscast that airs weekdays at 5:30 PM. The best newscast is submitted every year to the New York State Associated Press Association. Juliana Spano at the AP award ceremony. WRHU was also ranked #1 college radio station in the U.S. by The Princeton Review. Listen to WRHU anytime with our live stream!